In my last post, I detailed how to manually credit affiliates for sales that did not track through the Rakuten Affiliate Network, so today I going to show you how to manually cancel (void) orders. Cancelling orders is not something affiliate managers want to do, but it is part of the game. Orders can be cancelled for various reasons including: customer refunds, PPC bidding, unauthorized coupon code use, and the list goes on. 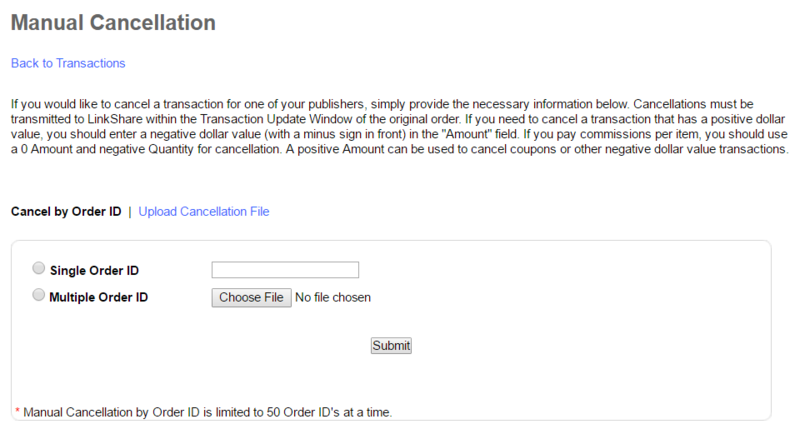 Below is a step-by-step approach to manually cancelling orders (one or multiples). In order to get started you need to go to the “Account” tab and then click the “Transactions” link. It will bring you to the page where the cancelling process begins. This page should look familiar to you. This is where you can manually credit affiliates for sales. 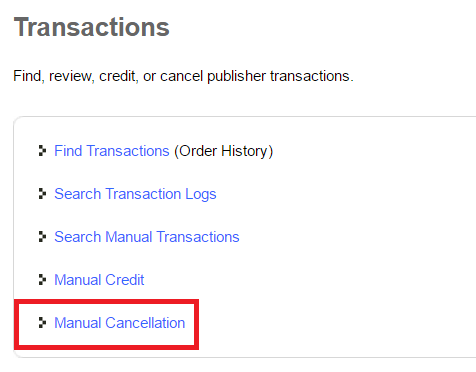 To cancel an order, click the “Manual Cancellation” link. If you have just one order to cancel, simply put the order ID in the box and click the radio button to the left of Single Order ID. If there are multiple orders to cancel, then you must select the Multiple Order ID option or you can upload a cancellation file and the orders will be canceled. If you want to upload a cancellation file (which I recommend if there are more than 10 orders to cancel) you must click the “Upload Cancellation File” and it will show you the format it must be in and the fields that are required. For the purpose of this exercise I am cancelling a single order. After the order ID to be cancelled is input and “submit” is hit, you must verify the action. Once everything is verified and correct click “Submit Selected Items” and the action will be processed and be reflected in the account within 24 hours. After the orders are cancelled I recommend following up with a network representative to ensure they processed and the commissions were cancelled. Cancelling orders should be done as frequently as possible so that they do not pile up and then require a lot of time at the end of the month.